It was a good choice for me; I found so many of Reta’s thoughts familiar (even ones I didn’t know I had until I read them). It was comforting to see them so well articulated on the page. Reading this book felt like talking to a friend. All my life I’ve heard people speak about finding themselves in acute pain, bankrupt in spirit and body, but I’ve never understood what they meant. To lose. To have lost. I believed these visitations of darkness lasted only a few minutes or hours and that these saddened people, in between bouts, were occupied, as we all were, with the useful monotony of happiness. But happiness is not what I thought. Happiness is the lucky pane of glass you carry in your head. It takes all your cunning just to hang on to it, and once it’s smashed you have to move into a different sort of life. Reta is “not interested, the way some people are, in being sad”. But the disturbing actions of her daughter are taking a toll on her. She distracts herself the best she can with her daily activities; she continues to clean her house, visit her friends, and work on her novel. Life goes on around her; Bush becomes President, Chretien is Prime Minister, Margaret Atwood wins the Man Booker Prize. But Norah is constantly in her thoughts, and she tries to work out what has gotten her to this place; she feels it was most assuredly something she did wrong as a mother. Reta researches the meaning of ‘goodness’ trying to figure out how to save her daughter. All the things that could be wrong with Norah march through her mind. This ‘fight’ to get Norah back leads her to ruminate about the state of the world in general, and the power of women in the world, in particular. Unless is the worry word of the English language. It flies like a moth around the ear, you hardly hear it, and yet everything depends on its breathy presence… Unless you’re lucky, unless you’re healthy, fertile, unless you’re loved and fed, unless you’re clear about your sexual direction, unless you’re offered what others are offered, you go down to the darkness, down to despair. Unless provides you with a trap door, a tunnel into the light, the reverse side of not enough. Unless keeps you from drowning in the presiding arrangements… Unless is a miracle of language and perception… It makes us anxious, makes us cunning. Cunning like the wolves that crop up in the most thrilling fairy tales. But it gives us hope. Happy marriages: For those of you who have, like me, noted the lack of happy marriages in novels, you’ll be interested to know that the couple in this book have a happy marriage. They choose to comfort and support each other through the trial of their daughter’s lifestyle choice, rather than let it come between them. The radio host in Baltimore asked me – he must have been desperate – what was the worst thing that had ever happened to me. That stopped me short. I couldn’t think of the worst thing. I told him that whatever it was, it hadn’t happened yet. I knew, though, at that moment, what the nature of the “worst thing” would be, that it would be socketed somehow into the lives of my children. This matters, the remaking of an untenable world through the nib of a pen; it matters so much I can’t stop doing it. Blurting is a form of bravery. All I wanted was for Norah to be happy; all I wanted was everything. 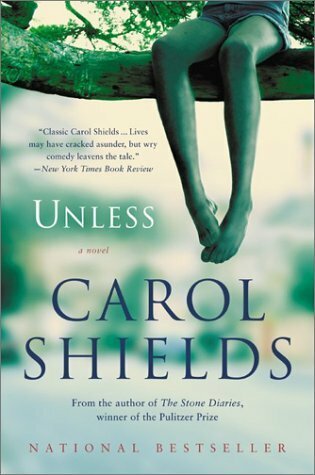 What Carol Shields book(s) have you read and loved? I’m so glad you liked this Naomi, this and The Republic of Love are the two Sheilds books I’ve read and I loved them both. I want to read ALL her books now. And you’re right. It’s nice to read about a happy marriage once in a while! This is one of the few Shields books I haven’t gotten to yet, but I’m looking forward to it. The Stone Diaries is my favourite of hers so far. I also liked Larry’s Party. I loved Larry’s Party when I read it this summer, and I really like the premise of this. I remember your review of Larry’s Party. I’m thinking that you can’t go wrong with any of her books! I’ve had this on my shelf for years and haven’t read it. I bought it because I loved The Stone Diaries so much. It sounds like I need to pick this one up sooner rather than later! If you loved The Stone Diaries, I imagine you’ll also like this one! I haven’t yet read a book by her, I hadn’t even realized she’d written several. I’ve been hesitant to plunge into Unless because I find young adult children in trouble books distressing, having mothered two teenage boys into adulthood. However one of these days I’ll take the plunge, she is a must-read. Thanks for this great review. I haven’t read anything by Carol Shield yet either and haven’t heard of this one. It takes a certain kind of writing talent to make you feel close to the narrator. How refreshing to hear about a happy marriage and where parents are trying to bring a child in closer rather than push her away because their caught up in themselves. I was thinking of you when I added the bit about the happy marriage – remembering our conversation about it. Now I can’t remember which book we read that brought it up in the first place! Thanks for this review, I had read this many years ago and enjoyed the refresh. I appreciated the Stone Diaries this summer and find her books to be relatable to everyday life. That’s one of the things I liked about it so much – the familiarity. I also love books that are very different my own life, but sometimes it’s nice to be able to relate. Great review! I loved “Stone Diaries,” so I think I will have to check this one out too. You probably can’t go wrong with any of her books! Great review. Loved Unless when I read it years ago. Of course, we all want the best for our children. I love how the parent sticks by her child. I’m looking forward to the movie. I loved that they just did not know what to do. And, how would you? I also loved that the sisters went and sat with her every Saturday. Let me know when you see the movie! I’ve read and thoroughly enjoyed The Stone Diaries, Larry’s Party and several of the short stories in The Collected Stories of . . . I also have Unless on my shelf, so far unread, although I’m not certain why I’ve forgotten to get back to this favourite author. Thanks for the reminder. The Republic of Love and Larry’s Party are my two favourites. There’s something about Republic that reminds me a little of Elizabeth Hay’s Late Nights on Air which I love. The Republic of Love was a close second. But now I have it to look forward to! Most people seem to know her and love her, even if they haven’t read her recently – that’s a good start! I really loved The Republic of Love but I haven’t read Unless – I think that needs to change now that I’ve read your review. When I was deciding, it came down to Unless and The Republic of Love. So, now I have The Republic to look forward to! I haven’t heard of this author before. Very nice review. It’s good to see a happy marriage in a book for a change! I was so happy about the happy marriage – it is so rare to see in novels (usually, for good reason). But, she let the conflict center around their child, and let them keep their bond (a realistically happy marriage – not a still-madly-in-love marriage, which would have seemed silly). Now that you know of her, you’ll have to try one of her books – I think you’ll like her! She has many to choose from, but you might want to check out Swann – it’s her ‘literary mystery’. I read The Stone Diaries so long ago that I feel like I don’t remember it well enough anymore. Luckily, I still have it. I will have to put that one on my re-read list! 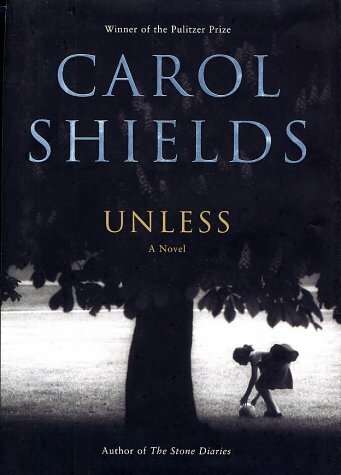 It’s been a long time since I’ve read Carol Shields, too. Maybe I should pick this one up. I am fairly sure I read The Stone Diaries, but it’s so long ago, I’m not positive. Sounds like it’s time for some Carol Shields! 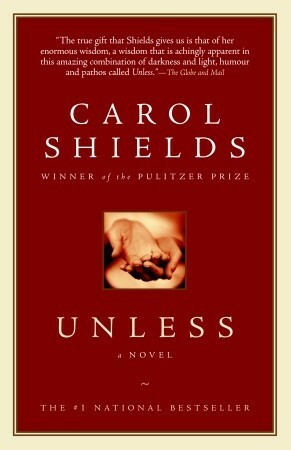 Carol Shields is one of my very favorite authors. She is one I can reread again and again. (If I get around to rereading, that is!) I always love to see bloggers feature her. Terrific review! I would love to continue to read more of her, and will eventually, but I have a few others to read first. It’s nice to see her around, though, isn’t it? 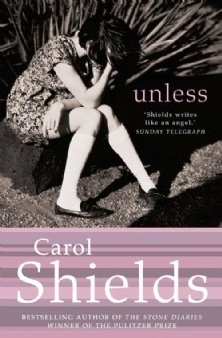 I still haven’t read Carol Shields. * hangs head in shame * But goodness, this book sounds so very good. As usual, love the quotes you pulled. 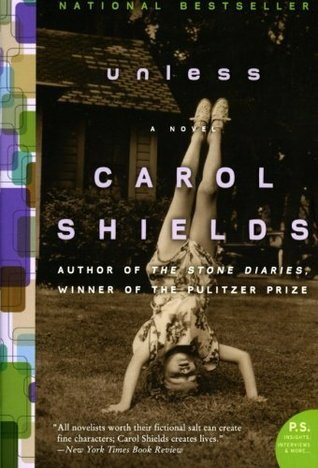 I’ve never read Shields, but her books sound like memoir to me for some reason. I kept reminding myself as I read the review that it’s fiction. The characters did all feel so real to me! They have a happy marriage eh? That’s a first in novels. I was a sucker for her novel The Stone Diaries but I haven’t read more of her. I have a copy of Unless though. She was good! Miss Carol. The Stone Diaries is her most popular novel in my comments. Read Unless for a happy marriage! There’s a solid marriage in Bonnie Burnard’s A Good House, too. Another novel in which mostly nothing happens. Another novel which I love. Were there any books with happy marriages in your Literary Wives book club? I can’t remember you talking about any! So I’m glad this one provided something more positive! I see that you’re on a role with posting reviews recently! Seems like the kids are back in school and you have a bit more time to blog now. That’s great! You’re almost done with your Can Lit project, which must be very exciting. I need to find a year-long project for 2017 to keep me focused but that offers lots of freedom. I will start looking around soon! Yes, the kids are back in school, and I’m trying to catch up on the books I read in the summer that I haven’t written about yet, but still want to, as well as trying to keep up with my Fall reading. Soon I’ll be done with the summer books – only a couple more to go, and I think I’ll combine them in one post. There doesn’t tend to be happy marriages in our Literary Wives books, which is why this one stood out for me. I was hoping to finish my CanLit Project this year, but my plans have been thwarted by the Shadow Giller. But the delay is worth it. 🙂 I’ll still be finished pretty soon, and I have some ideas, but nothing definite. Can’t wait to hear more about your project once you identify it! The quote on happiness has me sold. I need to read this! It has been so long since I read Shields. I’m pretty sure The Stone Diaries is the only book of hers I’ve read and that was decades ago. I’m going to change that now!